"Sky" Tan Flats. Tan hue, pleated detail, antiqued-brass signature hardware, stripe cotton lining, padded footbed, signature sole. Crafted in Spain. " Actual color may slightly vary due to screen/monitor resolution ". New Condition. Cole Haan Kody. Seersucker look. A twist on the classic Oxford. Material - Synthetic & Leather Heel Height approx 1/4"
New with box flats ideal for work or play, enjoy! Leather lining and sole. Made in Italy. NEW! SPERRY TOP-SIDER Womens 10 Gold & Ivory Striped Espadrille Flats Shoes! NEW without box! 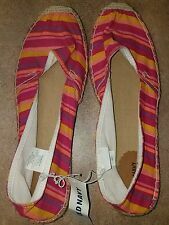 SPERRY TOP-SIDER Womens 10 Gold & Ivory Striped Espadrille Flats Shoes! Get ready for summer with these STUNNING flats!! Slip on and run out the door in comfort and style! Any questions please ask! Thank you for looking!! SYNTHETIC FABRIC RUBBER-TOE LOAFERS--by ROCKET DOG. MAN MADE SOFT SOLES. Reef Comfort Shoes Size 10 Flats. Shipped with USPS Parcel Select Ground. CIRCUS BY SAM EDELMAN. Lulu Striped Espadrille Bow Mule. Striped canvas mule with knotted. Notched vamp. Padded foot bed. Slide style. Merona for Target striped flats in a navy and off-white color. Worn once, only for a couple hours, so otherwise excellent used condition. Fits true to size, which is a women’s 10. Condition: Great pre-owned condition. Look to have been worn very minimal. Note the wear on heels. The rest of the shoe looks excellent! Color: Yellow, Cream, Tan. Length (Heel to Toe): 11". Width (Widest part of the pad of the sole): 3 1/2". Franco Sarto. White Stripe. Box Included. Size 10 M USA. Cash – If you pick up the item. Local pick up is available in the Fort Lauderdale FL area. 🥿 Rue 21 Etc! Smoking Flats size 10 M Black & Silver Metallic Stripes; Cool! 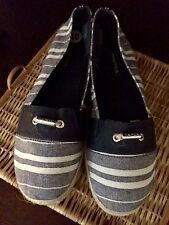 Smoking flats size 10 M in black and silver striped fabric. They're in very good condition inside and out; see the photos for details. One pair only; the photos are of this actual item.